This is what I made for Eid this year -- Eid is the big meal at the end of Ramadan, where small gifts are often exchanged. The MOTH had brought home these rubber stamps -- St. Hildegaard and a small text stamp "Grace happens." I happened to have a bunch of little cotton drawstring bags so I stamped them with solvent ink in two colors (gray and olive green). 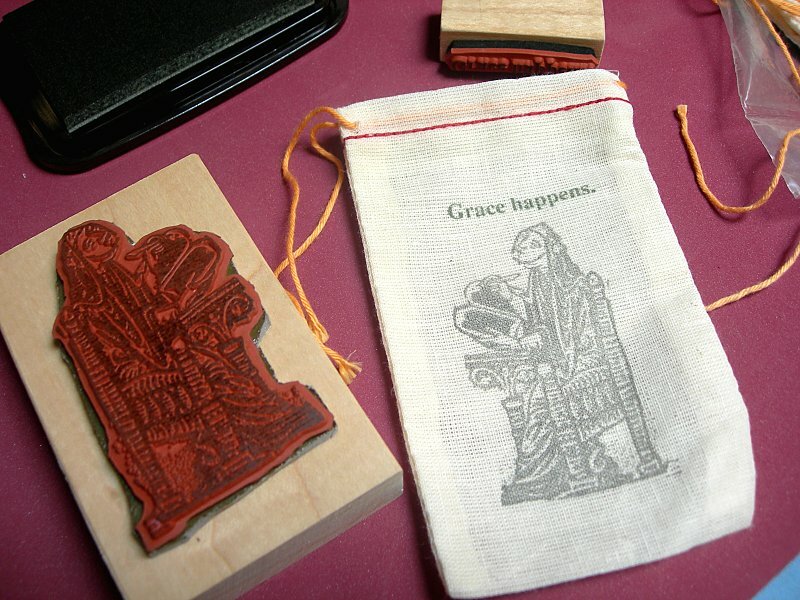 To make sure the solvent ink adhered well to the cotton fabric, I slipped a small piece of cardstock inside each bag before I stamped them, and stamped on top of my nice thick foam stamping pad. After the ink dried (solvent ink dries very quickly), inside each bag I slipped a small milagro of La Virgen de Guadalupe, AKA Hazreti Maryam. Easy, quick, and each is one of a kind! 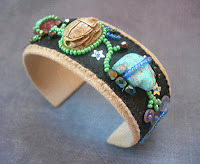 Learn how to create a sturdy, heirloom-quality cuff bracelet using basic bead embroidery stitches and a few handy construction tricks. In the first class, you'll design and start embellishing your bracelet, which you'll finish for homework. 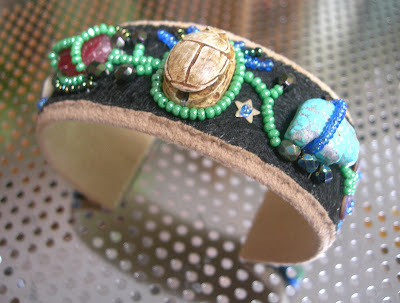 In the second class, you'll learn how to shape the metal core, attach your bead embroidery, and cover the back with ultrasuede. Sound like fun? Click this link to find out more. Learn sequin stitches that are suitable for embroidering clothing, art quilts, felt, handbags, and other fabric surfaces. 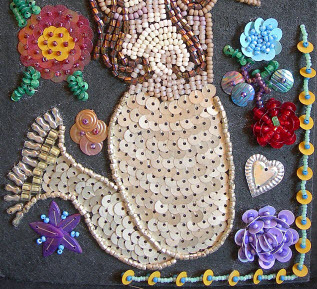 Explore the secret techniques of the Magic Flower, the mysteries of the Haitian Hill, plus hidden thread, full coverage and floral tricks and tips, using flat and cupped sequins, with and without seed beads. We'll create an embellishment sampler in class. People really seem to like this class a lot -- the pace is relaxed, but you learn a lot of techniques that are easy to remember later. Click this link to find out more. Scarab for a long life, turquoise bear for strength and spirit, carnelian stone for the heart. Where have I been? I didn't know Etsy had an About page. 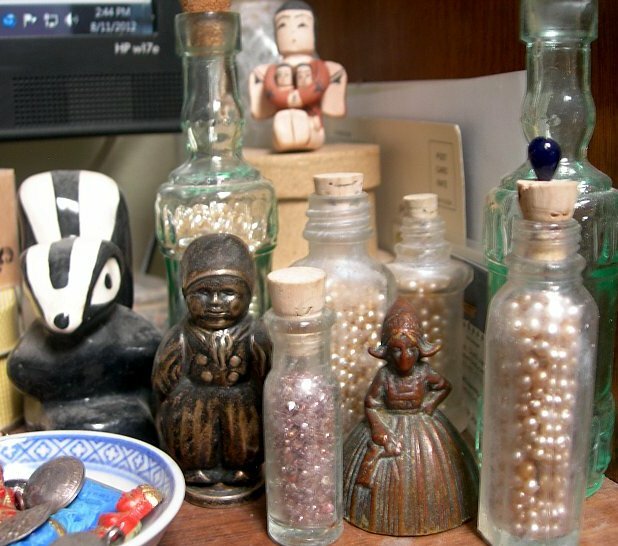 It's kinda cool because you can make a slideshow of up to five pictures, with captions. Congratulations! Your Shop About page is now published and CAN BE SEEN BY THE WORLD. I also have to admit I don't understand the purpose of all these various little profile-ish things at Etsy ...and I'm SURE I have not followed any kind of consistency in terms of branding, LOL. 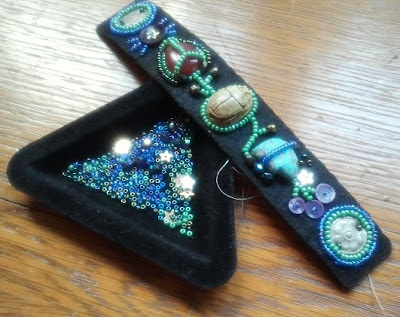 Just got back from another visit with my Ma... and while there I managed to sit for a bit and finish the beadwork for another Lucky Charms bracelet (a class I'm teaching at the Harwood in September).